Pyramids are powerful, mystical and ancient, and are to be discovered in virtually every country in the world; at least 80% of them are aligned north-south. The 4,500 year old great pyramid, one of hundreds in Egypt, is undoubtedly the most famous, with the slightly older Mayan step pyramids in Mexico a close second. There are plenty more still to be discovered, including three in Sarajevo in 2005 which could be 25,000 years old. But who had that technology 25,000 years ago? And who had the means to travel the globe giving lessons in pyramid building? And how did they know pyramids have to be aligned north-south in order to work? And most perplexing of all, what was their purpose, what were they for, what do they do? 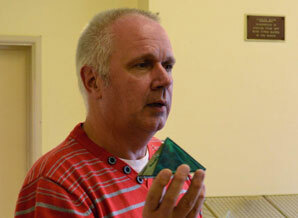 In his talk on Thursday 14th June, Jan van der Elsen confessed to being passionate about pyramids, and described his early experiments which changed his life. On hearing claims that pyramids could preserve plants, meat and fruit, or improve crop yield on seeds stored inside a pyramid, as a teenager Jan ‘knew’ that was nonsense, and set out to prove it. He set up an experiment with a small cardboard pyramid aligned north-south, a second pyramid not aligned, and an ordinary box. He placed inside each one a flower from the same plant, and left them for a couple of weeks, confident all would be shrivelled and dead. Yes, the flower in the ordinary box was very dead, and in the non-aligned pyramid too. Imagine his surprise when he discovered the flower in the pyramid aligned north-south was perfectly preserved, dried out certainly, but as beautiful as it had been on day one. “No no,” said his science master at school. “That can’t be right, we’ll set up a scientific test in the laboratory,” which they did. This time they used meat and the results were the same. They did it again and again, and it worked every time. You can make your pyramid any size you like, but the base must be square, and the sloping angle of the sides must be 61 degrees. This forms one of the most stable structures known to man, which may explain how they have survived, but why were so many built in the first place? The answer to all these questions is - we don’t know! Our forebears obviously knew, but we don’t, although Jan suggests they draw and funnel energy in from their apex, which is magnified by their shape and acts as a lens. So what was their purpose? Jan points out that wealthy Egyptian pharaohs used pyramids as tombs, and their ability to preserve makes that highly appropriate. Also their stability, and being so difficult to break into, would be useful in a tomb too. Mayan pyramids in Mexico form a temple complex, and Egypt's Giza pyramid was originally covered in white stone, probably marble, which would shine in the sun, making a beacon visible for miles around. The all-important north-south alignment suggests they may have been used as astronomical instruments. The three Giza pyramids are placed in the same configuration as the stars in Orion’s belt. The plot thickens. So what are the uses for a pyramid today? Jan brought along several beautifully-made glass pyramids measuring just a few inches, and they can be used for cleansing crystals, charging essential oils, and even water if you have one large enough. Plants watered with charged water apparently grow more quickly than those watered with tap water. A larger glass version made a great fruit bowl and prevents bananas from ripening so quickly. The dimensions of a pyramid are a classic example of sacred geometry, and at the beginning of the meeting Jan had placed a pyramid under the chair of a volunteer who was suffering a painful knee, and under a lady who admitted to suffering severe stress. At the end of the meeting he asked them how they felt, and both readily agreed there was a significant improvement. Pyramids don’t have to be made of glass; you can make them of any material - metal, canvas, cardboard, bricks, and stone. The important thing to remember is that the base must be square, the sides must lean at an angle of 61 degrees, and it must be aligned north-south.